Within the boundaries of the Ramsey Ward, Cambridgeshire, lies the town of St Ives and one of the finest examples of a toll chapel in the world. The Chapel of St Ledger, also known as the Chapel on the Bridge, was developed by the monks of Ramsey Abbey, who had built the town's first bridge, a wooden structure, in 1107. In 1414, it was decided to replace this timber bridge with a stone construction and add a toll chapel dedicated to St Leger. Monks from the nearby Ramsey Abbey would stay for several days, in shifts, and host travellers and worshippers, as well as collect their tolls. This unusual 15th century chapel, sitting squarely in the middle of the River Ouse, is now managed by the Norris Museum in St. Ives, who kindly gave permission for the Ramsey Ward to hold a seminary lesson in the chapel itself. Sister Anne Chambers, seminary teacher, shared her special teaching experience: “I love teaching the youth in the Ramsey Ward every day, but it was especially fun to teach them in this historic, little chapel on the bridge. I learned that hundreds of years ago, travellers would stop off at the church to receive a blessing before embarking on their long journeys. I hope that the students felt the blessings of seminary as we discussed the importance of good friends, and how to acquire spiritual knowledge, as they embark on their journey through life. It was especially meaningful to me that one of my good friends, who lives in St. Ives, and her daughter, wanted to come and hear me teach here. I believe they felt the Spirit, and they graciously accepted a copy of the Book of Mormon that day. 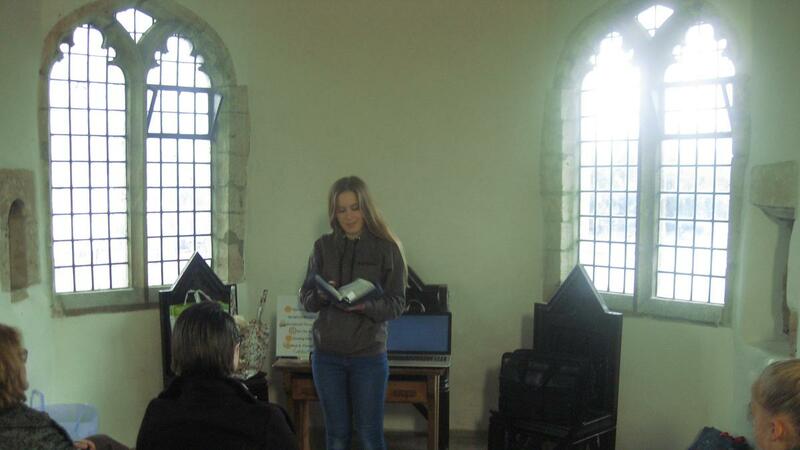 I also loved that the sun went down during the class and we could really feel how it was to be in church in the middle ages, when there was no heat and only candle light in the chapel. I am full of admiration for the people who lived hundreds of years ago and who did all that they could to be faithful to the knowledge that they had of Jesus Christ. I hope that we can be as faithful to the knowledge that we have of the restored church of Jesus Christ on the earth today. I love the gospel and the blessings that we receive as seminary teachers.” , Sister Anne Chambers. “It was so great to hear the gospel taught in such an amazing chapel. I’ve walked over the bridge several times, passing the little entrance door, but didn’t realise the significance of this small but beautiful place of worship. We all felt the spirit as Sister Chambers taught us in this special little church,” Kirsten Cryer (17), Ramsey Ward.